To work as a waiter or waitress can be a way to start a career in the food industry or can be a part-time job. They carry out a function help patrons to understand menu choices and make recommendations about selection based on the preferences of their patrons. The profound quality of a waiter is to engage customers in a positive way and set a pleasant tone for their meal. The duty of the waiter should be to inspect the food presented by cooks before delivering it to the customer on the table and to make sure that the order is complete and cooked with the specifications given by the customer. The aim of the job is to satisfy the customer with the meal and work on the complaints if given by the customer regarding food, service and ambience. They must possess good listening quality first and should carefully listen to the orders given by customer as sometimes one can often meet with complicated people. He or she should be able to memorize and understand the specific needs of their customer in order to communicate and correspond their desires/requirements clearly to the cooking staff. Sometimes customers might be interested and question about the dishes or menu items offered in the restaurant so they should be able to converse with the customer in a simple with little complicated way. The examples of good complication skill can be non-verbal communication like eye contact, body language, etc. 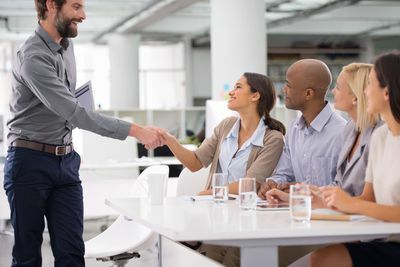 with the customer, clarity and concision in the messages to be conveyed, friendliness behavior, empathy with the employer, co-worker or employee etc. It is important to meet the requirements and demand of the customer even when they may not seem entirely reasonable as customers can be rude sometimes while demanding or telling their needs to the waiter. A rude or dull answer from your side can affect your tip-dependent income. The examples of interpersonal skills can be able to motivate others, problem solving skills, resolution of conflicts etc. A server should have a pleasant personality with appropriate dressing. Wear business casuals to the interview. Don’t be overly formal unless you are applying for a high end establishment. Employers can ask for a practical demonstration of your work to see or analyze your quick performance by maintaining an appearance of assuredness and calmness. They should have the ability to move swiftly without appearing to be in a rush. A high quality focus and attentiveness are required to make work quick and easy. 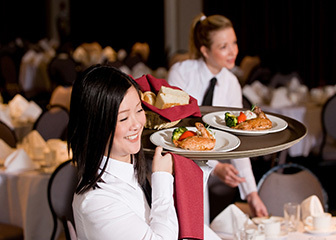 The multitasking quality is highly required for the job of waiter as they need to manage several things at once because sometimes multiple orders of cocktails at the beginning of the meal may clash with another meal has to move on to dessert while still another may be simultaneously ready to be cleared and turned. Each and every table has its own little life span with the customer and it is critical that waiting staff remain familiar with the various levels of each demand given by the customer in a given moment. Each customer is going to demand for a different meal so a sharp and good memory is highly required. Some customers may insist to prepare meals with the elimination of certain food ingredient as they could be allergic for those ingredients so that needs a major concern regarding the need of the customer. So, the question can be asked by the interviewer that “What kind of tips you will keep in your mind while taking orders from your customer”. The answer can be given in a way that as it is required to have sharp memory, while, taking orders from different customers at the same moment, so a handy notepad with a pen could be kept to note down the orders for be in a safer side with all the specification if given by the customer. The interviewer can also check your patience by giving certain conditions like by yelling or arguing for certain orders or for the delay in the order. It is needed to show your high patience power by dealing with them as a customer which you can do by answering them in a polite way and making them calm by communicating in a softer tone. To see your performance, the interviewer may ask you to give a live demonstration like table setting, pouring of beverage, process of making coffee by using coffee maker, the process of serving desserts etc. The establishment will expect you to be calm and responsive to the situation rather than being reactive. As the customers you may encounter may be in varied state-of-mind and may react to any given situation differently. However, to ensure customer satisfaction the hospitality industry looks for personalities with these qualities. Most of the time the waiters/waitresses are not expected to have a degree or a certificate. However, the recent surge in the hospitality industry has led to reform in their expectations. If not a 3-4 year degree the candidate is often expected to have a certification in handling food. There are various certification courses now available in Food handling, Food service management, Alcohol serving certification, Food safety and services, etc. These certifications may prove to be very useful in securing you a job in the hospitality industry. Accuracy, Attentiveness, Cleaning, Carrying trays, Communication, Courtesy, Customer service and satisfaction, Dependability, Flexible, Friendly, Cash and credit handling, Memorizing (menu and pricing), Service oriented, Knowledge of Sanitation, food preparation, food hygiene, food handling and food preferences and understanding of customer needs and preferences. The hospitality industry is the most booming industry around the world. Specialized individuals with specific skills are highly required to cater to the customer satisfaction in this industry. 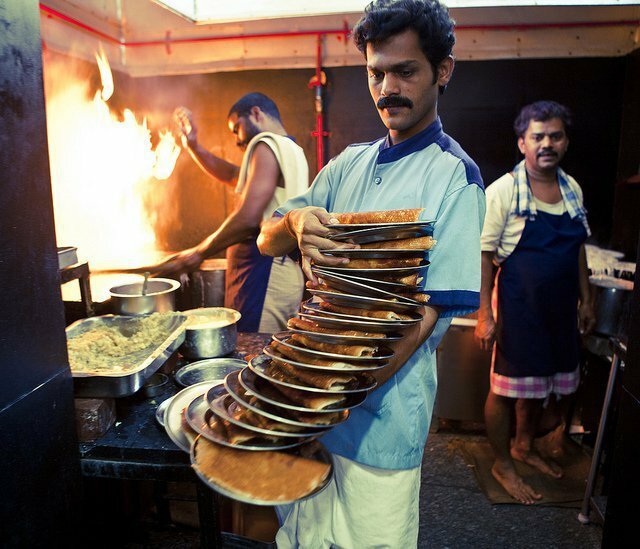 The waiters/waitress are expected to follow industry standards and norms. The above mentioned skill sets will help you secure your position in this vast industry.